I wanted to share my prep and my fears about going on a solo writing retreat because while I lead super fantastic writing retreats, you can make your own, and they can be just as terrific! Going on a solo writing retreat takes planning and courage revving. 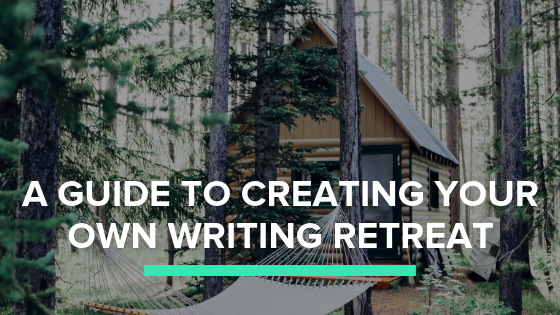 Because a writing retreat is not a vacation, but instead a deep dive into your mind and heart while practicing a craft that can be challenging. You need to prepare. Also, if your life is anything like mine, finding an entire week to devote to a writing retreat is as rare as seeing a snow leopard, so you want to make the most of it. First, why go on a solo personal writing retreat? Once you get clear on why to go, give some thought to what you want out of your writing retreat. If you can get away, consider what kind of place would best support you. I’ve been fantasizing for years about being able to write without the Internet, without people, and with nature to walk in right outside my door. But you may want to go out at night and people watch, take a morning yoga class, or visit museums to conduct research. Get clear on where would support your best writing. If you can’t get away, what kind of space could you borrow or create at home that would fill this need? Don’t assume because you can’t spend money on a getaway, you have to stay home. Follow your desire! Is a friend going out of town? Could you do an apartment swap with someone? Cat or dog sit? If you do need or want to stay home, can you ship your family out? Or can you sit your roommates down and explain you will be in silence for the next few days? Clear clutter even if that means putting distractions in a closet so you can’t see it. Set super clear parameters with yourself (no house cleaning, no opening the mail, no answering the phone) so you don’t stray off retreat. Eliminate shadow comforts. I don’t take any wine, tequila, chocolate (I know, gasp, but I’m allergic to cane sugar), or refined carbs with me on a writing retreat except my favorite popcorn. I want my head to be clear and free from distractions. What would muddle your head or make it easy to escape your process? Can you leave it behind, take it out of the house, or turn it off? Prime the pump. Do not – I repeat, do not! – go on a writing retreat having not written or even having not thought about your project for weeks or longer. This is a total set-up for frustration and so-called writer’s block. Writer’s block is usually “I don’t know what to write” or “I don’t know enough to write this yet” and “I don’t have faith in myself to write this well enough.” You can address all of these potential blocks by preparing ahead of time. Write for fifteen minutes a day and increase by one minute each day. Read material in your field and make notes before bed or on your commute. Make a bullet point outline for each chapter. If writing fiction, do the first few exercises in Story Genius or Save the Cat Writes a Novel. Build in outdoor time and ways to move. The body needs to move to think. Make sure your writing retreat includes time for dance, yoga, walking, running, and/or rolling around on the floor moaning. Break better. My dear friend Jeffrey Davis taught me how to make my breaks between writing blocks delicious. With my Mastermind writers and everybody at the Writer’s Oasis, we’ve been practicing giving ourselves wonderful, pleasurable breaks between blocks of concentrated work time. No screens, no chores, no to-do lists. Break better when on a writing retreat – and at home! Gather supplies. I packed three boxes of books and files to take, along with a yoga mat, snowshoes (I’m at 10,000+ feet), running shoes, my sketching gear, and my dog Stuart. I researched how to sync Scrivener with Dropbox when working offline. Lastly, I brought huge pieces of paper because I love writing out my chapter outlines on big paper and making “cluster” maps. What will satisfy you? This is the question I ask people at my retreats to reflect on before we start and then again when we end. I tell them satisfaction is not about a particular outcome – finish a draft, writing brilliantly – because you can’t guarantee an outcome. But what you can guarantee is that you show up for so many hours without multitasking. Or you that you give yourself pleasurable breaks. Or that if the Critic gets loud and nasty, practice self-compassion and active imagination. Or that you move your body. Focus on what is enough for you. I hope you create a wonderful writing retreat for yourself soon and tell me about it when you do.